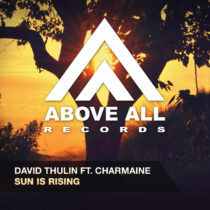 David Thulin already surprised us with a great vocal tune as debut on Above All Records and that David is a great producer is proven by his new song with Charmaine. The progressive beat in “Sun is Rising” creates a summer vibe that is a perfect base to bring out the best of Charmaine’s voice and lyrics. With the Jay Hubbard Remix we slow down a little bit and enjoy the warm atmosphere and delicate melody Jay used to give this his own touch! Supported by Cosmic Gate in WYM 165 !